Okay, amigos! If you’re looking for the perfect spot to watch the sunset here in Cayo Hueso, then we’ve got you covered. Although Key West’s famous sunset can be experienced from pretty much anywhere on the island, there are a few places where it’s absolutely maravilloso! From venues rich in history to others with lively entertainment, here are the very best places to watch the sunset in Key West. In the mood for a fiery fiesta?! If it’s a bit of a party you’re looking for, then head on over to Mallory Square. For decades, Mallory Square has been the home of Key West’s famous Sunset Celebration – a nightly festival where locals and tourists alike gather to watch the sun set into the horizon. Two hours prior to sunset, local artists, street performers, and food vendors come together to put on quite a show. From magicians to sword swallowers, we think it’s safe to say there’s enough entertainment to go around! It’s the perfect place to let loose, have some fun, and say adios to another day in paradise! We may be a little biased, but our restaurant is exactly where you want to be at sunset! 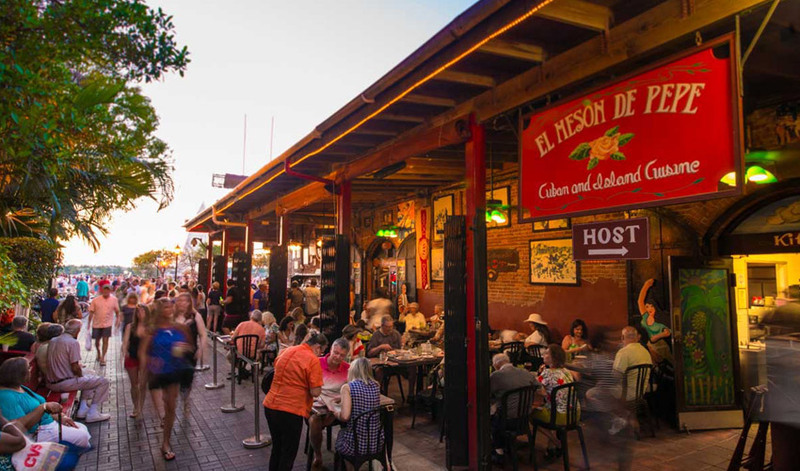 One of Mallory Square’s restaurants, El Meson de Pepe is the perfect spot to sit back, relax, and watch the sunset while enjoying authentic cuban food, tapas, and drinks. Beautiful views AND Key West’s very best mojitos? You can’t really beat that. We’ve got live music that’ll have you dancing in no time and plenty of traditional Cuban entrees that’ll keep you full and satisfied while you continue your eventful night on the island. The historic seaport is another favorite location to take in Key West’s gorgeous sunset. Enjoy a nice stroll on the boardwalk with beautiful pink and gold skies all around as the sun glistens on the horizon. Check out boats of all sizes at the docks and then grab a seat at one of the many open-air bars and restaurants where they serve fresh seafood that we hear is delicious! It’s a great place to hang out with friends and wind down from the day while enjoying some picturesque harbor views. For another beautiful view of Key West and its stunning sunset, make your way over to Sunset Pier. Located at the end of Duval Street at Ocean Key Resort & Spa, this vibrant pier is a paradise of its own. It’s a great place to relax, have a drink, and grab something to eat at the Tiki Bar & Grill. 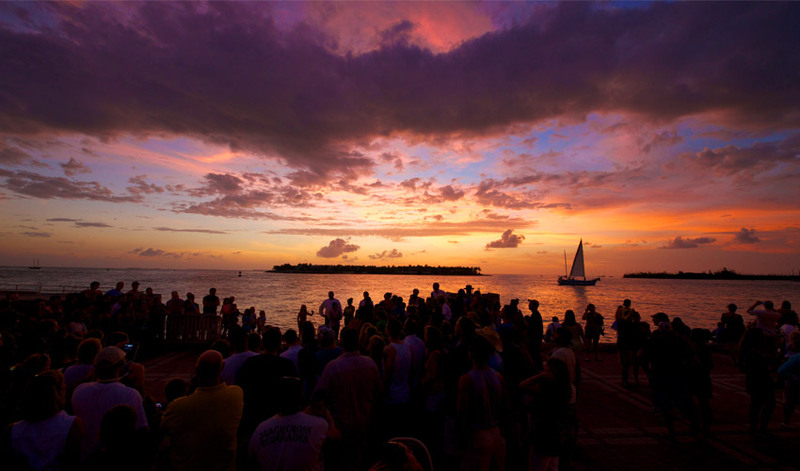 Plus there’s nightly music and dancing – both of which you can enjoy while watching the sun set into Key West Harbor. 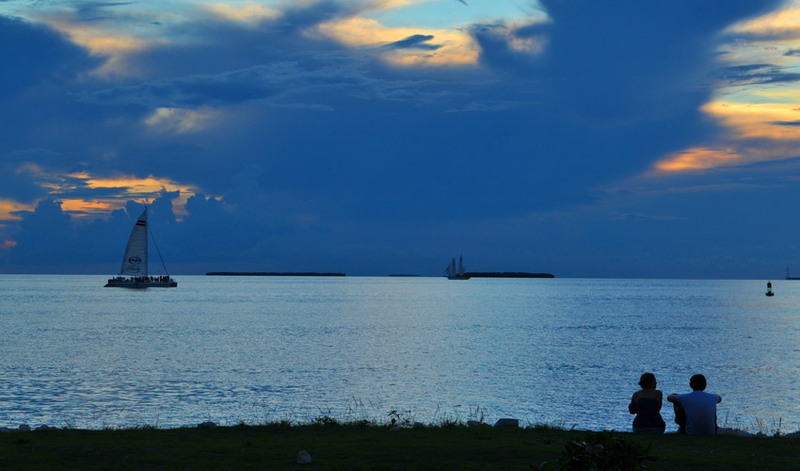 Another great place to watch the sunset that’s also rich in history is Fort Zachary Taylor State Park. The Civil War era fort marks the entrance to Key West Harbor, and its beachfront grounds are exactly where you want to be when the sun touches down on the horizon. Remote and full of so much natural beauty, it’s a picture perfect location to sit quietly on the beach while enjoying the setting sun. Finally, you can’t leave Key West without catching a sunset out on the water and there’s no better way to do that than aboard Fury’s Commotion on the Ocean. This live music sunset sail is one of the most memorable ways to experience the sunset, lounging on a spacious catamaran while listening to some tunes. Get up and dance or sit back and watch; but regardless, enjoy complimentary drinks and appetizers while feeling the warm ocean breeze around you. So there you go! 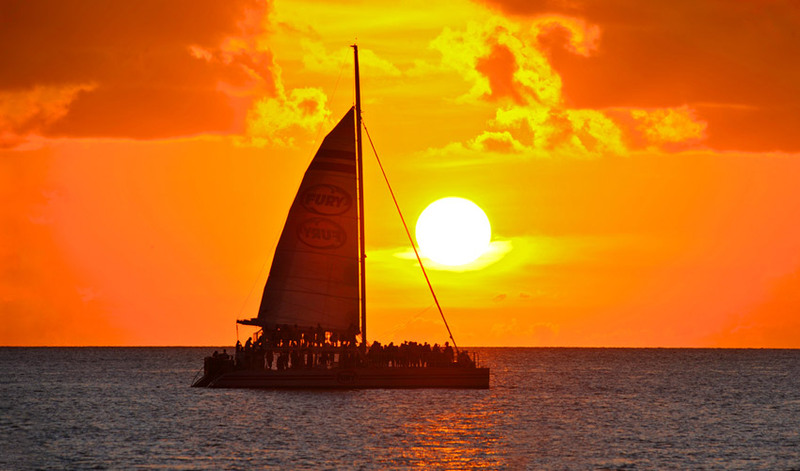 Some of the best places to watch the sunset in Key West! Again, you can’t go wrong just about anywhere on the island, but these are certainly some of our favorites.